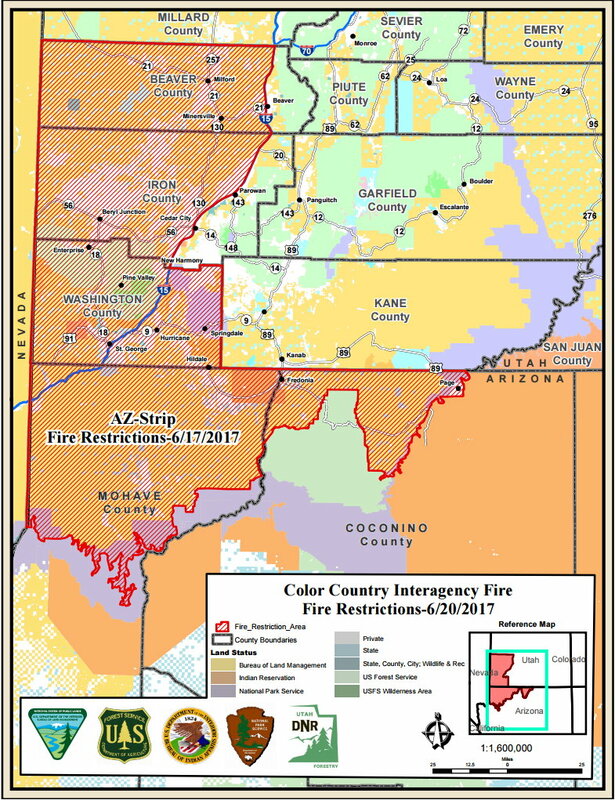 ST. GEORGE – Due to dry conditions and the increasing heat of the season, Color Country Interagency fire managers are implementing seasonal fire restrictions in southwest Utah and northwest Arizona starting Tuesday. The restricted areas cover all of Washington County, Beaver and Iron counties west of Interstate 15, as well as the Arizona Strip. However, it should be noted that fire restrictions for the Arizona Strip, Grand Canyon Parashant National Monument and Vermilion Cliffs National Monument went into effect Friday by the Bureau of Land Management. Fire managers hope the restrictions help prevent human-caused fires which account for 50 percent of all wildfires annually. Lightning generally accounts for the rest. “Over the last few years we’ve been on an increase for a trend” in human caused fires, said Nick Howell, fire mitigation and education specialist with the Color Country Interagency. Howell said he would like to see that trend reversed. 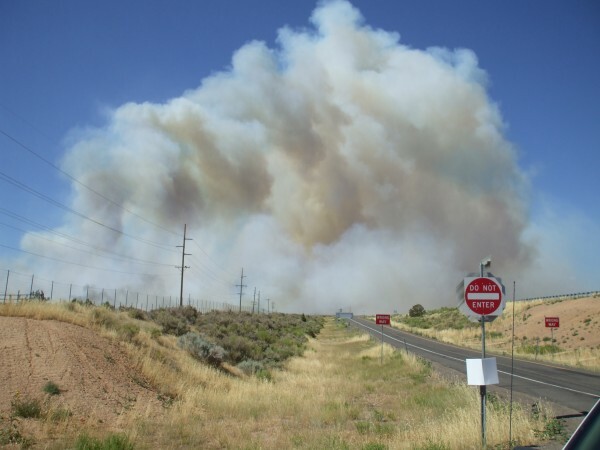 A typical wildfire season runs from June to September, Howell said, with an estimated 250-500 fires igniting within the Color Country Interagency’s jurisdiction annually. The restrictions cover unincorporated, privately owned land, as well as all state-administered lands. Lands also overseen by the Bureau of Land Management (Utah/Arizona Strip), Dixie National Forest (Pine Valley Ranger District), National Park Service (Zion National Park and Pipe Springs National Monument), and Bureau of Indian Affairs (Trust Lands of the Shivwits, Cedar, Indian Peaks, and Kaibab Band Reservations) are under the fire restrictions. Incorporated towns and cities are not included in these restrictions. Igniting, building, maintaining or using a fire, including charcoal and briquettes, outside a fire structure provided by the agency within a designated area is prohibited. Campfires and charcoal fires are prohibited in Zion National Park’s Watchman and South Campgrounds. It should be noted that abandoned campfires that aren’t completely extinguished are also a concern for fire officials in Utah. Improperly extinguished campfires can flare up once more, and with no one around to put it out a second time they can get out of control. Campfires, even if they appear to be out, should be cold to the touch before leaving them – stir the dirt with water until it is cold. All developed recreation sites, campgrounds, picnic areas and home sites that are maintained and administered by the agency, or home sites where running water is present, are allowed. Stoves or grills that are fueled solely by liquid petroleum fuels are also allowed. Campfires and charcoal fires are allowed in Lava Point Campground. When using a portable stove, make sure the area is clear of grasses and other fine fuels. Prevent stoves from tipping and starting a fire. The use of tracer ammunition, explosives, fireworks or any incendiary devices (including explosive targets) and the use of explosives, flares or other incendiary devices are always prohibited year-round on federal and state lands. Operating or using any internal or external combustion engine without a spark arresting device properly installed, maintained and in effective working order as determined by the Society of Automotive Engineers (SAE) recommended practices J335 and J350. Never park a vehicle over dead grass, the catalytic converter can ignite the vegetation. Cutting, welding, or grinding of metal in areas of dry vegetation. Smoking except in an enclosed vehicle or building, or a developed recreation site or areas of a minimum of three feet in diameter cleared down to mineral soil. Cigarettes should never be thrown out the window of a vehicle. Instead, ashtrays should be used in order to prevent wildfires. Violation of restrictions on federal lands is punishable as a Class B misdemeanor by fine, imprisonment or both. Violators also may be held personally responsible for reimbursement of fire suppression costs. All public, state, and unincorporated privately owned lands east of Interstate 15 in Iron and Beaver Counties are not currently in fire restrictions. “Lands not in fire restrictions are becoming increasingly dry and fire danger is increasing daily,” Interagency fire managers said Friday.